Welcome to EarthUSA News, a new expanded electronic newsletter on earthbuilding in the United States and beyond. EarthUSA News seeks to engage those interested and involved in earthen construction; to preserve and promote its cultural, economic, environmental, historical, and social aspects; and to be a source of both timely news and institutional knowledge. It further acts as a bridge between the biannual Earth USA conference — the largest conference dedicated to earthbuilding in the United States — as well as an outlet to those involved in complimentary fields and the general public. In this issue and issues in the future, you will find interesting articles and interviews, timely news, book reviews and podcast links, and upcoming events. We plan to publish this newsletter four times per year. We hope not only that you like EarthUSA News, but that you pass it on to colleagues and others who may have an interest in this field. We also welcome your written contributions to it. Contributions, comments, and questions can be sent to editor@adobeinaction.org. Earthbuilding in the Big Apple … Who Would Have Thought! by Richard Connerty - R. P. Connerty and Son Construction Co. I gave this proposal some serious thought and considered many factors. Firstly, I felt certainly knowledgeable and competent in laying mud floors. My company, R. P. Connerty and Son Construction Company, had laid several earthen floors and I had full confidence in our ability. We had further volunteered on a Cornerstones project, restoring an number of deteriorated capillas and moradas in Northern New Mexico; and, in the process, we had learned a great deal under the leadership of two experts, Sam Baca and Ed Crocker. And finally, I knew that with my son and brother in-law, I had the skilled labor to undertake this endeavor. Now, before formally accepting, I needed to figure out costs and procurement possibilities for undertaking such a job in Manhattan. Hockmeier had presented me with the square footage requirements of the floor plan, and, based on calculations, I realized that I need about six cubic yards of a clay and sand mix. Now, I’m originally from Boston but I knew New York fairly well as I had lived there for several years before moving to Santa Fe in 1978. In fact, when living in New York, I drove a cab and had a good idea of happenings of this city and how one gets things done. With this information, I phoned to Ray DiFrancini who assured me that he could deliver the six cubic yards of material at a reasonable price. Following this, I called Hockmeier back and offered him a cost figure for the work to which he quickly agreed. In fact, he agreed so quickly that it made me wonder if I had underbid the job. Nonetheless, two weeks later my brother-in-law, Kevin, my son, Eamon, and I were off-loading a dump truck at the service entrance of the Polo Corporation, shoveling the clay-mix into wheeled metal bins, taking it up the service elevator, and onto the showroom floor. It is there where we mixed the dry ingredients and water in wheelbarrows. The newly installed mud floor looked nice and the design staff of Polo Corporation were very happy with the result. The only hitch was that, as with all mud floors, they sometimes take a couple of weeks to completely dry out and time was limited. As it happened, while the drying was happening, other contractors walked back and forth over our mud floor. This created an aged patina that looked terrific. As for me, the best part of the job was that Eamon and I got to spend some memorable time together along with my dear mother-in-law, who lives on the Lower East Side, and who put my son and I up for the seven days that it took to do the job. And once again, Hockmeier and others at the Polo Corporation liked it. How do I know? They paid us in cash! So there it is … a phone call from the Polo Corporation leads to a mud floor in the Big Apple! Don’t let anyone ever tell you that earthen construction is limited to the Southwest! Earth USA 2019, the 10th International Conference on Architecture and Construction with Earthen Materials, will take place October 25th - 27th, 2019, in Santa Fe, NM. This conference, the largest of its kind in the United States, focuses on adobe, cob (monolithic adobe), compressed earth block, rammed earth, and any other material or method that uses clay as a binder. For anyone involved or interested in the field, this is a must conference to attend. Indeed, Earth USA 2019 is geared towards academics and practitioners as well as policy makers and the general public and draws attendees from all over the world. The conference will feature three days of podium presentations and poster sessions; a Friday evening speaker meet and great; tours of local earthbuilding sites in and around Santa Fe; and pre- and post-conference earthbuilding workshops offered by Adobe in Action. Furthermore, attendees can avail themselves of the opportunity to network with other individuals involved directly or indirectly, in this field. Furthermore, there will be commercial presentations including architects, designers, contractors, and product manufacturers. And, for this first time, the Fred Webster Earthbuilding Engineering Prize will be offered. This prize will be presented to an engineering or architecture student working on innovative design and engineering solutions for new construction or preservation projects in the earthbuilding field. A New Podcast Dedicated to All Things Earthbuilding! 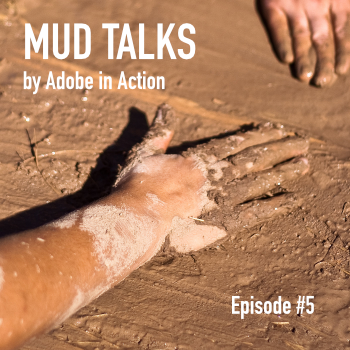 Mud Talks - a new podcast devoted to adobe and earthen construction - has been created by Adobe in Action (AinA), a non-profit organization based in Santa Fe, NM. As of this issue, five episodes have been produced by Kurt Gardella, co-executive director of AinA and feature Quentin Wilson, director emeritus of Northern New Mexico College's Adobe Construction Program and currently President of AinA. 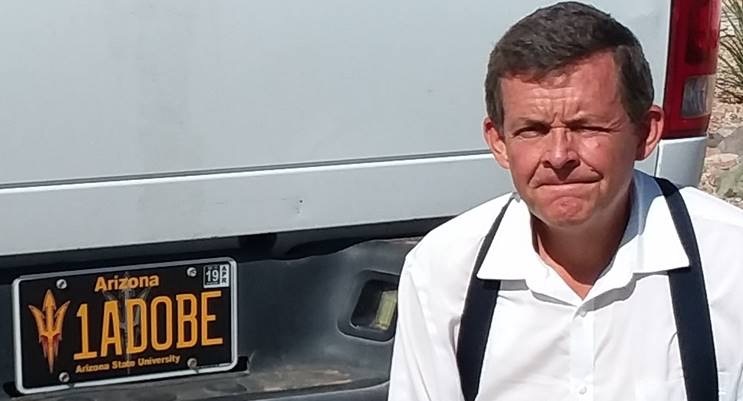 Furthermore, the most recent episode, the fifth produced, is dedicated to Richard Levine, the founder and longtime owner of New Mexico Earth Adobes. Levine passed away at the end of September 2018 and this episode includes a 2012 interview of him, recorded at the Swan House in Presidio, TX, (home of The Adobe Alliance). The Mud Talks podcast can be downloaded at www.adobeinaction.org/mud-talks/, iTunes, and other favorite sites where one downloads podcasts. In June 2018, San Antonio City Council voted unanimously to approve the adoption of the 2018 International Code Council (ICC) Building-related, Fire and Property Maintenance codes and corresponding local amendments. In San Antonio, adopting the latest ICC codes occurs every three years following the three-year update cycle of the ICC. What was remarkable in 2018 was that included among the local amendments was language related to the use of earthen materials in building construction. This made San Antonio the first municipality in the United States to adopt International Building Code (IBC) -based amendments on earthen construction (EC). The adopted amendments, which comprised changes and additions to IBC Section 2109: Empirical Design of Adobe Masonry and to corresponding definitions in IBC Chapter 2: Definitions, were put forth by Earthen Construction Initiative, a San Antonio based 501c3 organization devoted to advancing and promoting earthen construction. ECI was motivated to take this on when in February 2018 at a member’s meeting, San Antonio City Councilman and architect, Roberto Treviño asked if it would be helpful to have more representation for EC in the local building code and pledged his support of an ECI-sponsored proposal during the then ongoing ICC adoption process. Between February and May, the five-member ECI technical committee chaired by Michael Donoghue, PE of Austin, TX, met regularly to research current codes on EC, develop a proposal strategy, and craft language suitable to regional conditions as well as to a potentially wider U.S. audience. Ground work for ECI’s proposal was laid by The Earth Builder’s Guild (TEG) in the previous ICC cycle. Prior to its 2018 publication, IBC Section 2109: Empirical Design of Masonry dealt primarily with fired masonry and contained only a few provisions about earthen construction. Due in great part to the preference for frame buildings with masonry veneer, the chapter had seemingly become defunct causing it to be considered for deletion. Present at the ICC hearing where this matter was discussed, TEG members realized the possible tragedy of losing a nod to EC as an opportunity to successfully propose a rewrite of Section 2109 based on successful language from the New Mexico Earthen Building Code. Having this language already in the IBC, provided a point-of-origin for ECI’s proposal and for discussions with officials at the City of San Antonio’s Development Services Department. Prescriptions that would guide officials on how to interpret code to adequately inspect earthen structures was a tangible concern as several rammed earth or compressed earth block (CEB) structures had in recent years been built within city limits. Development Services officials aided ECI with their feedback and with help navigating the formal amendments process. Considering adobe, CEB, and rammed earth as the primary technologies that would most often be used locally, ECI’s proposal centered on developing language applicable to all three. Chapter 2109 in the San Antonio Building Code is now aptly titled, Empirical Design of Earthen Construction. The new code went into effect on October 1st. A summary of the changes is available on the City of San Antonio’s website at https://docsonline.sanantonio.gov/FileUploads/DSD/CI2018-001.pdf. Lauran Drown, AIA is a founding member and the current vice president of Earthen Construction Initiative. She is a Texas-registered architect employed with Wiss, Janney, Elstner Associates, Inc. where she specializes in building enclosure consulting for contemporary and historic buildings. 1. How did you get involved in earthbuilding? In kindergarten, I toured the old adobe Fort El Pueblo in my hometown, Pueblo, Colorado. The lifelong interest, passion, and quest for knowledge in earthen buildings and methods had begun. In the years that followed, I visited Bent’s Fort, another massive adobe structure which was rebuilt near La Junta, Colorado. Spending many years walking around the empty space where it once existed, I saw first hand and from practitioners how the massive fort was rebuilt. Additionally, I volunteered at Fort Garland, another adobe fort on the western side of the Sangre de Cristo Mountains in Colorado. In my free time, I regularly searched out adobe buildings as well as adoberos in my hometown and learned a number of things that continued to pique my interest in, and knowledge of, adobe building. 2. What you currently working on? I have been working on a number of projects. Current endeavors include working on my own adobe house in Phoenix, Arizona. This has required me to search for the city’s adobe building codes as I was met with dead ends at the Building Department. Secondly, I have been working with a number of other individuals on projects. For example, this past summer, I assisted in the construction of an adobe hogan on the Navajo Nation for an extended Navajo family. Furthermore, I have been volunteering with Brick by Brick, a compressed earth block project in Scottsdale, Arizona. And I have been helping a number of neighbors who need basic instruction on how to simply and affordably maintain their adobe homes. Thirdly, I am experimenting with a common weed that produces a latex sap for use as a stabilizer. Trials of the plant have so far proven effective. And lastly I continue to add to an annotated bibliography of adobe and earth building resources that I began several years ago. At this point, the bibliography includes nearly 12,000 sources. To make it more accessible to practitioners and scholars, I have begun to rank the top 50 sources — journals, books and movies — in various earthbuilding sub-topics such as mud plasters, rammed earth, cob, and earthquake stabilization for adobe. 3. Where do find your passion in this field? For example, are you particularly interested in the community building, cultural, economic, engineering, environmental, regulatory, or sociological aspects of earthbuilding? My passion for the field is in building infill housing in large cities of the Southwest where adobe architecture is or has existed. Infill is building on vacant lots in already established or transitioning neighborhoods. Another passion or goal would be the construction of sub-divisions or housing developments across the Southwest. My passion for earthen architecture is rooted in the local economy using locally available resources: earth, laborers, and building materials. 4. Within earthbuilding, where do you see important contributions coming from in the future or likewise where do you see earth building going? Future contributions in earthbuilding will come from space travel. For example, out of the Apollo space program to the moon, artificial joints were developed. In space, joint hinges cannot be oiled as the oil would float away. The same principle is seen in artificial human joint, as oil cannot be applied or be present in our bodies. On planets, there is a limited amount of space and resources for building materials. Yet, we need only look to what is present. For example, on Mars, the soil is readily adaptable for soil construction. The science behind seismic engineering, thermal resistivity and capacitance, along with durability and resilience are all the same needs that exist on earth. Young scientists and engineers are relearning about earthen construction because of the excitement of space travel and colonization which will aid greatly, at least in my view, earthen construction on earth! Additionally, there are those throughout not only the United States but the world who are currently making advances on 3D earthen printers, on the thermal factor of earthen architecture, and on the resilience of earthen architecture … these are all current factors affecting earthbuilding. 5. Why is it important that the general public become more educated about earthbuilding? Earthbuilding helps the local economy through jobs, technological training, sourcing local building materials, using less energy to heat and cool our homes, and living in cleaner nontoxic spaces that often leave no carbon footprint! Each issue we feature an individual in the earthbuilding field. If there is someone you think would be wonderful for us to interview, or about whom you would like to know more, please let us know by emailing the editor of EarthUSA News at editor@adobeinaction.org. Please find below upcoming activities and events. While seeking to promote earth building activities and events, EarthUSA News cannot vet or verify all activities and events, or the entities that are organizing them. As always, please contact the entity with any questions or concerns that you may have. More information on the courses, registration, and the certificate program can be found at www.adobeinaction.org/certificate-classes/. Adobe in Action is a New Mexico-based 501c3 non-profit organization which supports owner builders with the planning and construction of adobe homes; promotes adobe home building and ownership through education and student-based field support; produces Mud Talks, a podcast dedicated to earthen construction; and organizes Earth USA, the largest biannual conference on earthbuilding in the United States. Board Meetings - 6:00 pm; Members Present! Speakers Series - 7:15 pm. Earthen Construction Initiative (ECI) board meetings are held each first Tuesday of the month at 6pm at the Southwest School of Art. Following board meetings at 7:15pm, ECI hosts Members Present! a popular short-format presentation series where a member or invited speaker shares knowledge on a topic related to the use of earthen materials in building. Board meetings and Members Present! are both open-to-the-public and free to attend. ECI is also happy to announce it's first fundraiser event to take place in spring 2019. For more information on these and other ECI happenings, please visit our website at www.earthenci.org. ECI is a nonprofit organization founded in 2016 whose mission is to advance and promote earthen construction through research, education and outreach. Based in San Antonio, Texas, ECI boasts nearly 50 members from across Texas and neighboring states. Abstracts must be submitted using the Earth USA 2019 online abstract submission form. Earth USA 2019, the 10th international conference on architecture and construction with earthen materials, is now accepting abstracts for papers and presentations at the 2019 conference. Earth USA 2019 will be held in Santa, Fe, New Mexico, from October 25th to 27th, 2019. It is the largest conference dedicated to earthbuilding in the United States and draws presenters and attendees from all over the world. All abstracts should be submitted using Earth USA 2019’s online abstract submission form. More information on paper subject categories, deadlines, and other relevant information can be found at www.earthusa.org/call-for-abstracts/. EarthUSA News very much welcomes your contributions. EarthUSA News promotes earth building architecture and construction as well as its its cultural, economic, environmental, historical, and social aspects. The target audience of EarthUSA News is not only those directly and indirectly involved in the field but also the general public. Submissions can include articles, timely news, book reviews, and upcoming events or activities. They should be clearly and concisely written. Photos are also welcome. We reserve the right to edit, postpone, or reject submissions based on relevancy or other matters. We regret that at this point we cannot pay for such submissions. For more information on contributing, please do not hesitate to contact the editor at editor@adobeinaction.org. Mark Your Calendars! Earth USA 2019 to be Held in Santa Fe, NM, in October 2019. Mud Talks! A New Podcast Dedicated to All Things Earthbuilding!